Carnarvon National Park is one of the best ones in Queensland. Inland from Gladstone and Rockhampton on the Capricorn Coast, Carnarvon is one of the best national parks in Queensland. In the dry outback of Queensland, it's an oasis with moss gardens, rock pools and pockets of lush rainforest, where Carnarvon Creek has carved a deep gorge into the sandstone, leaving 200m-high white cliffs to surround it. And it is known for some of the best Aboriginal rock art in Australia. There are different sections in the park. The westernmost Ka Ka Mundi and Salvator Rosa are the most remote. Ka Ka Mundi protects rainforest patches and the native brigalow scrub with lots of native wildlife. In Salvator Rosa there are some heavily eroded sandstone cliffs like Spyglass Peak and the Eye of the Needle. The early explorer Major Thomas Mitchell (who gave the name for a species of pink cockatoos) camped in Salvator Rosa on his way to the Gulf Savannah. There are no amenities in Salvator Rosa or Ka Ka Mundi and campers have to be self-sufficient. Mt Moffatt is another remote section of Carnarvon National Park, with some of the most spectacular sandstone formations in Australia. It used to be home for the Nuri and Bidjara Aboriginal people. The most significant Aboriginal rock paintings are in the Kenniff cave – now closed to the public because of the risk of the cave roof to collapse under the unstable rocks. The cave is named after Kenniff brothers – two bushrangers who used to hide in the cave and kill the policemen who were sent out to arrest them. There are no tracks from Mt Moffatt to the other sections of the park and campers need to be self-sufficient. The gorge. Poster by AllPosters. Click on thumbnail to buy. The 16,000ha Carnarvon Gorge is the most accessible and most visited section of the park, with marked walking trails, camping sites and a caravan park which is accessible for 2WD vehicles. There are 21km of bush walking tracks in the gorge where you can spend days hiking along the main gorge as well as the colourful and lush side-gorges with remnant rainforest plants, cabbage tree palms, ferns, gum trees and ancient cycads. The animals include platypus, echidnas, eastern grey kangaroos, wallabies, rock wallabies, bettongs, possums and over 170 species of birds including lorikeets, honeyeaters and powerful owls. There are a few short walks in case you don’t want to spend the whole day walking. The shortest is the 2km Nature Trail that gives you a snapshot of the flora and fauna of the gorge floor. The 3km Boolimba Bluff Track passes through a diversity of habitats on top of the cliff and has some good views over the gorge. This walk is best done in the morning as it gets very hot in the midday sun. 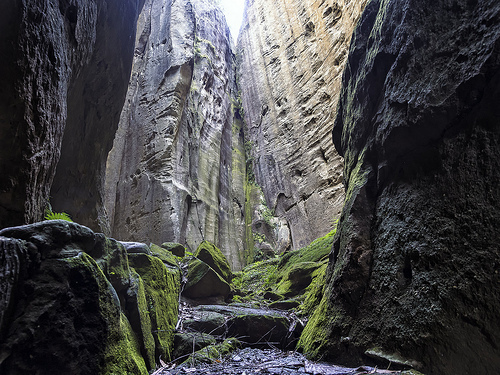 The Mickey Creek Gorge Track takes you to one of the side gorges – it is 1.5km long and includes some rock-hopping in the end. Sun can hardly reach the gorge bottom and parts of it get quite cool even in the middle of the day. The 500m Baloon Cave Track goes through open palm forest to a site of Aboriginal art in Baloon Cave. Gorge walk. Poster by AllPosters. Click on thumbnail to buy. If you are a keen bushwalker, head off to the main gorge. The Main Gorge Walking Track is 9.7km long and crosses the creek 22 times on its way to the Big Bend in the other end. Along the main track which is mostly flat, there are several side-tracks to side gorges which can be a bit steeper in places. The first of them takes you to Boolimba Bluff, and the second to Moss Garden – a moist waterhole where the water that constantly drips from sandstone walls supports many species of mosses and ferns. It is 3.5km from the visitor centre, and 650m off the main walking track (one way). Moss garden. Poster by AllPosters. Click on thumbnail to buy. The next side-walk on your left hand side is the Amphitheatre – a 60m deep chamber, carved in the rock by running water. The Amphitheatre is 4.3km from the visitor area and 630m off the main walking track. The next one on your right hand side is the Wards Canyon, a 270m steep walk away from the main track, with the rare King Ferns and a pocket of remnant rainforest. On the other side of the main creek you can soon turn into the Art Gallery – one of the main attractions in the Carnarvon National Park with over 2000 engravings and Aboriginal art on the 62m long sandstone walls. The Art Gallery is 5.4km from the visitor area and 300m off the main track, the last part of it is a gradual uphill walk. About 3.5km later on the main track you come to Cathedral Cave – an eroded overhang of sandstone cliff with a panorama of some great aboriginal art examples across its walls – the cave sheltered Aboriginal people for thousands of years. One hundred metres away is the spectacular Boowinda Gorge, and a few hundred metres north is the Big Bend – a natural rock pool beneath some looming rock walls, and the end of the main track. Places to stay include Best Western Hospitality Inn, Central Apartments Carnarvon and Carnarvon Gorge Wilderness Lodge. Aboriginal rock art. Poster by AllPosters. Click on thumbnail to buy. Here's a map of Carnarvon National Park - you can double-click anywhere on the map to zoom it in and see the places closer. Drag the map to move around, and if you want to see the satellite image with Google Earth, click on "Sat" in the top right hand corner. 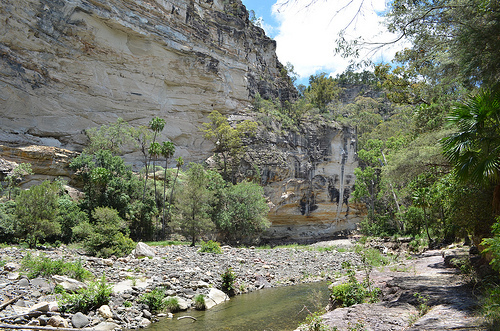 Been to Carnarvon Gorge National Park?